Tucker slept the entire way home from the vet’s office. He was about 6 hours post-op when we picked him up, and was as out of it as a bear in hibernation. When we arrived at the house, one of us stayed in the car with him, while the other went inside to lay out some plastic under his bed, just in case he had an accident during the night. 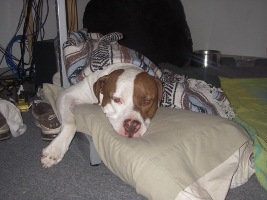 My husband carried him into the house and laid him down on his favorite pillow, covering him with blankets. He seemed to be somewhat awake during the move, but quickly closed his eyes and began to softly hum until he fell back asleep. All was quiet until about midnight. At this point Tucker began to wake up and start to wonder what was going on. He was trying to get up, but could not (probably due to the tranquilizer/pain killers he was given), and he started to cry out. We did our best to try to comfort him, but the moaning was absolutely heartbreaking. We were told to wait until morning to start his meds, but we knew we had to give him something for the pain. We got him to eat a bit of kibble and rice from our hand, and snuck a dose of Tramadol in with his meal. We laid with him for about 30 minutes until he started to calm down. He drank a bit of water and even changed positions a few times before settling back down to sleep. Things were quiet again until about 4 am when Tucker began to be restless once again. At this point I figured he must be uncomfortable because he needed to go potty, so we did our best to set up some blankets around him to keep him out of the ensuing mess. My intuition was correct, and about 10 minutes later Tucker began to relieve himself – never before have I been so happy to see a dog pee on my floor! I could tell Tucker was a bit confused by my acceptance and apparent joy at this event, but I think he just figured we were all losing it, as he simply rolled the other way after he was finished doing his business. For the first few hours after surgery, Tucker was already making a great recovery. He had already eaten, broken free from the clutches of anesthesia, escaped nausea, and urinated! We could only hope for more good things to come.